I’m excited to introduce our all-time favorite salad – this gorgeous, nutritious, delicious burst of color! I’m revisiting the recipe from a while ago because we make it often and love it, so I wanted to get better photographs to share with you all. That and I recently made a homemade creamy cilantro-lime dressing to toss it with and WHOA baby; flavor explosions with every bite! We think the dressing and salad are a perfect marriage – so crisp and refreshing together. I love grabbing a spoon and scooping up all the beautiful colors and plant-based goodness. 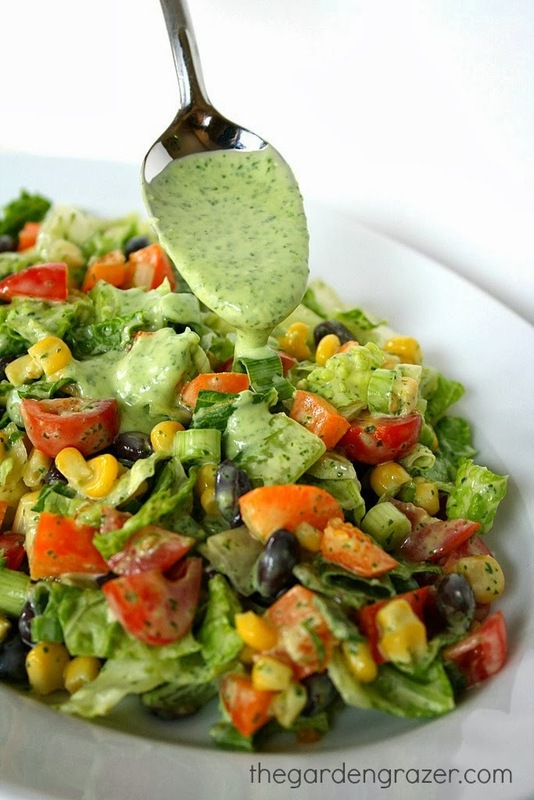 For us, one recipe of the cilantro dressing is a great match for the amount of salad below. Hope you enjoy if you give it a try! 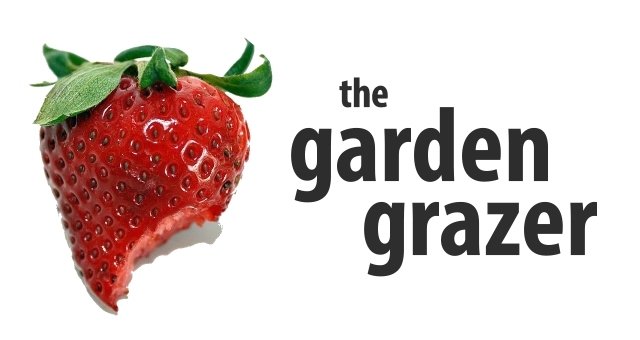 Come join The Garden Grazer on Instagram 🍓 and share a pic if you make this – I love seeing what you guys cook up! 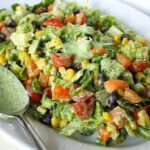 We're wild for this Southwestern Chopped Salad tossed in the most delicious, creamy avocado cilantro-lime dressing! Beautiful colors, flavors, and textures galore! Toss with desired amount of dressing. 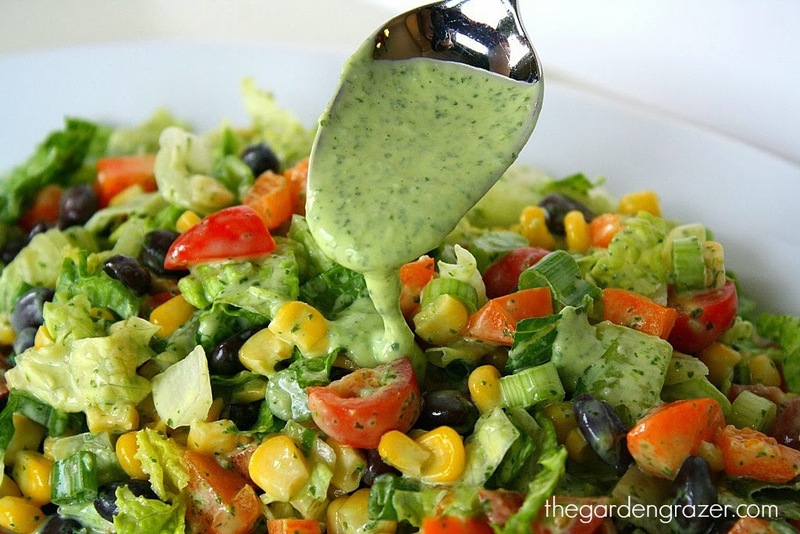 Read more about the notes and variations of the Creamy Cilantro-Lime Dressing here. Recipe yields roughly 4 main dish servings, or 6-8 smaller side servings. Beautiful! Can the salad dressing be made without the olive oil? Love this!!! Eating it right now! I doubled the recipe and put 1/4 cup oil and 1/4 cup avocado instead of 1/2 cup oil- it is so good! How many calories for the dressing? This recipe is so fresh and delicious. I took it to a friend's house and everyone devoured it – even 4 very picky kids! Absolutely fabulous, thank you for sharing. Best salad ever! Thanks so much. How much will this make? I am feed 5 men at the firehouse tomorrow and just wondering if i need to double or triple this recipe. Hi! I would definitely double it for 5 hungry firemen 🙂 (or triple to be on the safe side… leftovers are always awesome!) How nice of you to make them food – hope they enjoy! Thanks Peggy! Agreed 🙂 Nothing like eating out in the fresh air! I'm making this tonight for a meeting i'm hosting at my house! this is my first time making salad dressing homemade, so pray for me cuz I'm nervous! hahahaha!!! it's a beautiful salad packed full of vitas and other fun necessities… can't wait! Thanks so much for sharing this! Hey Adrianne! You can do it!! I bet you rocked it last night 🙂 Hope you and your meeting buddies enjoyed! Trader Joes also makes a delicious Cilantro dressing if you want to make it a bit easier. Can't wait to try this. Agreed!! That was actually my inspiration for the dressing. It's so good I had to try my own variation at home 🙂 Hope you like it! I was so excited when I saw this and only peeked at it when I saw it had cilantro salad dressing, because I love TJ's but never have time to go there….how does this recipe compare to TJs version? I can't wait to try it! I love TJs dressing that's what I thought of when I saw this recipe! How does this compare in taste? Also is this just enough dressing to use for this salad alone or does it make extra? How far ahead can you dress this salad? Looks delicious! Hi there! I've always added the dressing right before eating, so I'm not sure how far in advance you could do it without the salad getting a bit soggy. Sorry! This looks so yummy, think I will add some avacado to it! Thanks for the recipe, I love your page. Hi Katie! So glad you're excited about the recipe. Cilantro is one of those funny things where it seems like people either love it or hate it 🙂 I bet you could definitely use dill or even basil (though I can't speak from personal experience!) Or if you have a Trader Joes nearby, I've used their hummus dressing on this too. If you try a different herb, I'd love to hear how it turns out for you! Good luck and hope you enjoy! so stumbled upon this via Pinterest and just made it today! YUM! I bought some thin steak to add to it for lunch and may add grilled chicken for a second day lunch! I like the dressing, but had to add in a tad of sugar just to take away some of the tang. Will def make again for summer salads! I made the dressing but it had way too much garlic. I had the taste in my mouth the entire day. Next time I'll make it without garlic. Thanks for the recipe though. So, ever since discovering your blog, I basically pin every recipe you post. This one is no exception — it looks delicious! Hi Kate! Haha that's awesome news 🙂 We must have the same taste buds! Hope you enjoy this one too! Found this on pintrest and making for dinner tonight with some tilapia! Im so excited it looks delicious! Im sure I will be making this A LOT this summer! Hey Kerri! Yay, so glad you're excited! It's an amazing go-to meal for summer – light, healthy, and fresh 🙂 Enjoy your dinner tonight! I made this salad for a Cinco de Mayo luncheon at work. Everyone loved it! I mixed the dressing with the veggies the night before and then with the lettuce when I got to work. Hi Frajes! Hope you enjoy! This dressing is absolutely amazing…..I could drink it from a cup! The salad is great too! Thank you.Everyone who ate it was asking for the recipe. I added avocado and pureed it with the dressing and chopped some up and mixed in with veggies. It was so yummy. I took it to two Cinco de Mayo parties this weekend. Everyone loved it- yummy and healthy. Thanks for the recipe! Hi! Here's the dressing recipe for you (there are also additional notes/variations on the recipe page if you get a chance to check it out on a computer sometime). I see there are at least two variations of this recipe .. this one and the vegan one! That is great, do you have any recommendations … to make it vegan with out the oil? and less salt? Thanks! your recipes look great!! I made your salad last night for dinner, we loved it! Even the husband! You'll find a review of your recipe in today's post on my blog. (I didn't insert the link in the comments because I didn't want this to look like spam) We're going organic and I've subscribed to your blog to keep the fresh recipes coming 🙂 Thanks so much for sharing! Hi Nikki! That's awesome – so glad you liked it! Awesome to hear you're going organic 🙂 Thanks for the comment, take care! Great dressing . My husband who hates hates cilantro loved this dressing. I loved it too . I added a little sugar ,I think I added too much lime juice. Hi Deb! Thanks for the message 🙂 And kudos to your husband for trying this dressing even though he doesn't like cilantro! Amazing to hear that he loved it! I have to tell you, I LOVE your cooking style. Everything I've seen here I have to make for myself. I'm so excited to try everything! And it looks so healthy too. Thanks so much for taking time to post these great recipes. Hi again AJ! Thanks so much for the sweet comments. I really love hearing people get excited about the recipes! Would love to hear which recipes you try out if you get the chance 🙂 Take care! Made this tonight. It was amazing! I used the avocado instead of the yogurt to make it vegan and halved the olive oil. Absolutely delicious! I think the only thing I will change is to add some Quinoa next time to make it a little more filling for the kids. BTW, they thought that I was trying to recreate Taco Bell's Veggie Cantina Bowl. And from them, that's a compliment! It actually reminded me of it as well, only I knew every ingredient that went into it, so felt good about them eating till their bellies were full. Thanks for yet another great recipe. Hi Torry! So glad you liked it! Using avocado is such an awesome idea. And so is adding quinoa to the salad – I am ALL for that!! 😀 Glad you and your kids enjoyed it. Thanks for the message! I just made this, it was absolutely fantastic!! The dressing is incredible, definitely going to be a staple in my kitchen from now on. Thanks for sharing! Hey Kerry! Hooray for finding new staple recipes! 🙂 I get so excited for that. Glad this was a winner for you! What would you think about Green Goddess dressing as an option? Oh my goodness. I just made this tonight. It was incredible! One of my guests said "I want to marry this salad." Well put. We are all raving. This will be my go-to salad for guests. Beautiful and delicious. Hi Debbie! Haha that's fantastic. It's great to have those go-to recipes that please the crowds 🙂 Thanks for coming back and leaving a message! Hey Tomekia! Awesome to hear! I love eating the leftovers for a quick and easy lunch that's ready to go 🙂 Thanks for the message! Loved this salad…beautiful colors, great flavor! Only drawback was that I was still tasting the raw garlic at bedtime and the next morning. 🙁 Next time I may experiment and try it with the garlic either roasted or sauted before blending it. But would definately make again! I just made this and it was AMAZING! Thanks for sharing! I added shrimp lightly cooked in olive oil and sea salt and added jalapeno to the dressing. Definitely a keeper! Don't have any fresh cilantro in my area but I do have the paste. Do u know how much I would need to use in replace of the fresh? Tried this salad today with the Cilantro Lime Dressing… It was very very good… The dressing alone is noteworthy. I thought the cilantro might overwhelm the flavors, but it is just right and tastes incredibly fresh. Thanks for posting it for everyone! Made this salad for our dinner tonight. My husband likes salads but is not a fan of them as a main dish. I grilled some chicken and added it to the salad before serving. I also made the cilantro-lime dressing which worked great with the salad. My husband didn't have any of the cilantro dressing (he doesn't like cilantro) but put his own dressing on the salad and enjoyed it. Said he would eat it again for a main meal. Thanks for the great recipes! I'll be visiting your website often! Sooo yummy! Added some tortilla strips for a little more crunch. Yum yum! Ok, this might be a dumb question…but did you just pour out the corn straight from the bag once it had thawed or did you cook it first? Made this for myself and hubby last night for dinner and had it again for lunch today…DELISH!! Added more black pepper and a dash of cayenne to the dressing to heat it up just a bit. Will definitely make this again. Thanks for the recipe! Hi there! Yay – so glad you and your hubby tried it and liked it! Leftovers are just as good (if not better) after all the flavors mingle for a while 🙂 Thanks for the message! A friend made this one night and offered it up to those of us that had just gotten done doing a crossfit/yoga workout and it was refreshing and super yummy, no one really talked while we ate it and I am so happy to have found the recipe and pin it to Pinterest so I can make it at home myself! You already got great comments. But just had to say how wonderful this salad is and how healthy it makes me feel! Thanks for your creative recipes! Hi there! Thanks for leaving a message anyway 🙂 I know what you mean about how healthy it makes you feel – it leaves me so energized! Hope you find other recipes you love here too! This was a hit! I changed things up to fit what we had on hand and what I like, and my husband raved about it! For the salad I used red onions, avocados and spinach. For the dressing I used low fat sour cream, lime zest, lime juice, cilantro, jalapeno (from our garden), minced garlic, sea salt, pepper, and cayenne pepper. Random measurements as I am horrible with it. Eating it for lunch right now. I am a teacher so having a NEW thing to bring to lunch is awesome before school starts. Thank you for the inspiration, I also shared it with a friend, who shared it with her mom and she is making it for a pool party this weekend. Hi Michelle! Loved your message, thanks! And I love hearing husbands rave about veggies – hooray! 😉 So glad you have a brand new lunch to change things up at work. Good luck with the school year!! This came out fantastic. I put two tablespoons of vinegar because I doubled the recipe…next time I'm going to stick to one tablespoon. It's a little acidic but since I love anything with vinegar, it's still pretty good in my book. It's going to go great with the southwestern salad I made. Thanks for the recipe! I have made this recipe countless times this summer and it is SO DELICIOUS! I've made it as lunch for guests, a side dish for dinner and even served it as a main course with grilled chicken cut up on top of it. My husband even enjoys it as a main dish and he is not a salad guy! 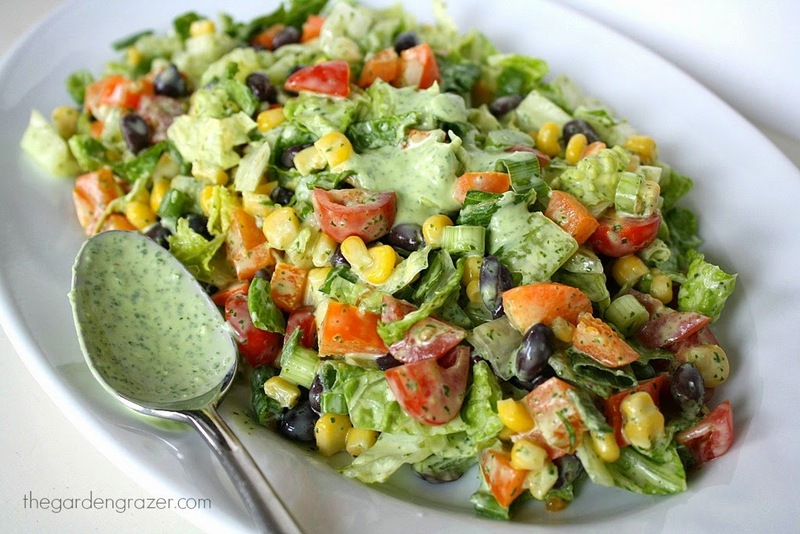 The dressing is so flavorful and goes excellently with the rest of the salad ingredients. I always make the dressing in the morning so it has all day to let the flavors "soak" in. Thank you for sharing this wonderful recipe! (Not to mention it also has great table presentation because it's so colorful). Hi Kelly! Loved your message, thanks! So great to hear you've made this many times. I LOVE hearing husbands dig in to their veggies – yeah!! 😉 Awesome idea making the dressing ahead of time to let the flavors hang! I have made this salad and dressing several times and they are both amazing! It is a summer favorite in my house! I have also used the dressing to marinate fish over night for fish tacos and it is awesome! Can't wait to try this! Making a grocery list right now- Thank you so much for sharing!!! Going to try this dressing today 🙂 Possibility for another salad ingredient would be feta cheese. Hope you loved the dressing! I love feta 🙂 That would definitely work on here! This sounds like the perfect dish for the Christmas lunch we are having at work. Do you think it would be ok if I chopped all the veggies the night before and just dressed it later? How soon before we eat should I dress it? Don't want to serve soggy salad if this gets soggy. Thanks! I am eating this as I type. It is EXCELLENT. My dressing seemed really thin, but I used regular yogurt so maybe that's why? I also used regular white vinegar because I couldn't find the bottle of white wine vinegar that I thought I had. I added a little shredded Mexican blend cheese to the salad and I've eaten half the bowl by myself. I even doubled the dressing so I can make this again tomorrow night. Thanks for the recipe! Hey Samantha! So glad you like it! The thickness of my dressing varies a little from time to time too, but the taste is the same. My husband and I usually double the recipe now too – one just seems like a tease and we always crave more 🙂 Glad you love it as much as we do! Hi Ingrid! Thanks for your message! I love your additions – I never thought to add red cabbage or broccoli to this salad. Sounds great! Glad you enjoyed it, take care! I made this salad last night for my boyfriend and I. I added chopped chicken to make it a dinner salad. The flavor of this salad and especially the dressing, was amazing!! I could eat this every day! Thank you!! My boyfriend is a big time carnivore and I think he was a little bummed that I made a salad for dinner, but once he tried it, he fell in love! He's a fan of cilantro and he just couldn't get enough of this vibrant salad! I love that the dressing is made with yogurt instead of mayo! I will be making this again and again! Jan. 3rd. 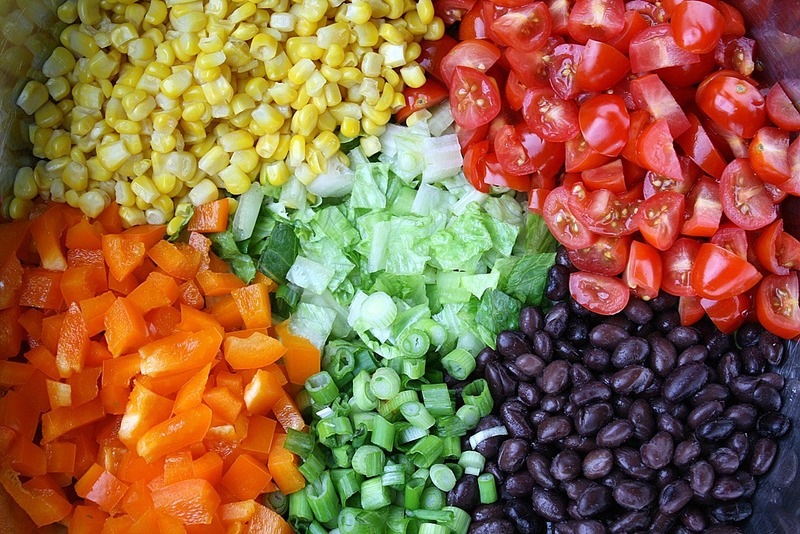 2014 ~ Made this colorful salad & healthy dressing today! It was FABULOUS! I added avocado…because I am obsessed with avocado! Thanks for the pinspiration!! My new favorite dressing! Thank you for sharing! Yesssss! Glad you enjoy it as much as we do! Hello, I don't like black beans. What would you recommend instead it? Haha – this is our favorite salad!! Hope you love it too! Can i use a lemon instead of limes i forgot to but them lol! Ha! 🙂 You know, I've never tried lemons instead but I bet they would work really well too! Would love to hear how it went if you try it! Enjoy!! I made this salad and dressing for a family gathering. I added avocado to the salad and a jalepeno with a few tsp. of agave to the dressing. It was fantastic and everyone loved it! I plan to make this again for an upcoming party. Thanks for posting the recipe. We love trying new ones. Hi Lisa!! Glad you tried it for your gathering and everyone enjoyed it! So awesome to hear that. Hope it's as big of a hit at the next party! 🙂 Thanks for the message! Found your recipe on Pinterest. LOVED IT ~ SO YUMMY!! and found the dressing a wee bit too tangy/tart for my taste so I just added some honey as you suggested and it came out perfect. I didn't dress the salad as it made so much, I just left the dressing separate. In my second helping (yup ~ had two big bowlfuls), I also mixed in a sprinkling of both cayenne and cumin….unbelievable. My roommate loved it too and put some grilled chicken on top. Hi Andi!! Loved your message – thanks so much for all your sweet comments! So happy you and your roommate loved it. I hear ya… I always have at least two big bowlfuls 😉 I usually make a double batch every time now because my husband and I gobble it up so quick and want more. I think if I had to pick one meal to eat for the rest of my life, this would definitely be it 😀 Haha. Thanks again, take care!! I had this salad for lunch today and it was so delicious!! I think it would also be a great salad to put into a mason jar too! I loved the dressing, it had so much flavor. I added cumin and a touch of honey. Next time I think I will only do one garlic clove. I did 1.5-2ish and its pretty garlicky but still amazing. I didn't even miss the cheese or tortilla chips. So glad I came across your site! Hi again Ruveen!! That is awesome to hear! I'm so happy you're finding recipes here you enjoy. My husband and I still can't get enough of the dressing – I always have to make a double batch! When I write out the recipes, I always try to keep in mind not everyone is as garlic-crazed as I am, but sometimes it still gets away from me 😉 Haha. Hope you find more recipes to enjoy! Hi Patricia! So awesome to hear! I always make the dressing with avocado now too after transitioning to vegan 🙂 Love it! Avocados are amazing. I love your idea of putting it in a taco bowl – I've never done that! Thanks so much for the message. Glad you enjoyed it!! I just made this for dinner today …beautiful day for it !!! this salad is so fresh and delicious and scrumptious… omg love this !!! This is a perfect dish for the summer! I made the vegan version of it. It was soooo good. Thank you! Hi Eileen! Yay! That's the only way I make it now too 🙂 So glad you enjoyed it!! I am making this tomorrow and had a thought for those of you who do not like cilantro. Why not try salsa as the dressing? I love cilantro so will be using the spec dressing. Looks fabulous! Yumm! So delicious and colorful. Made this today for mothers day and it was a hit! I added a yellow bell pepper and a whole bag of frozen sweet corn. Also made a double batch of the dressing which is incredible. I used 5 cloves of garlic and most of my family thought it was spicy. I love garlic but I want to taste the veggies and not let the dressing overpower the natural flavors. If you are making a single batch of dressing and your garlic cloves are tiny, use two, if not, one is plenty!! Hi ZT! I made a double batch of this yesterday too! Glad you and your family enjoyed it. I usually do 3 cloves of garlic when I double it since the original calls for 1-2. I'm a garlic lover too, but agree it shouldn't overpower all the delicious veggies 🙂 Thanks for the message! My family loves this salad….even my two young boys. I always put 2-3 chicken breast in a crock pot with taco seasoning and once its cooked, I shred the chicken and add it to the salad. The dressing and seasoned chicken go so well together. We also serve with tortilla chips sometimes. You mentioned in the recipe you recommend cumin or agave……how much do you recommend? We made this today and it was delicious!!!! We used only 2 tbsp of olive oil, and it was perfect. I also cooked up some chicken and added "Mexican" spices. I know it's not vegan any longer, but it was so good! 🙂 Thanks for sharing this recipe! Hi!! Yay! So glad you enjoyed it and were able to tweak the ingredients to your liking 🙂 Thanks so much for the message! Well, I read the recipe wrong and put the green onions in the food processor with my dressing, the dressing was delish as was the salad!!! Loved it!!! LOVE this salad, but I plan to try it without the raw garlic in the dressing next time. Don't get me wrong, it tasted wonderful, but I was tasting garlic still the next day. That doesn't happen when I cook with garlic. Hopefully the omission will not take away too much from the flavor. Have you ever tried it without garlic? Flattered to hear it's one of your favorites! 🙂 Thanks for the message! I made this salad and dressing for my son's 1st birthday party, doubled, for 30 guests. It was the biggest hit!! For the past week everyone keeps asking me for the recipe, I direct them straight to your site, and hopefully they search around website at other recipes! Thank you. I love salads and I'm always looking for new recipes! Absolutely refreshing and delicious! My family loved it definitely a keeper thanks Kaitlin! Awesome to hear Ann!! I'm a huge salad lover too 🙂 Thanks for the sweet message – happy new year! Just made this dressing and mine is pretty thick. I used olive oil and exact ingredients. Is it supposed to be that way? Hi Crystal! Mine is thicker now that I use avocado, but you can definitely tweak it (or add a touch of water) to thin it out if you prefer! 🙂 Hope it still tasted great! Hey Rachelle! YAY – glad you enjoyed it!! Still my favorite salad too 😉 Thanks for the sweet message! This was incredible, and better than other salads of a similar nature I've had while eating out at restaurants. Definitely a keeper for our family! Wow what a compliment! 🙂 So glad you enjoyed it – fun to hear it's going to be a keeper for you guys! Have a great rest of the week! Ahhh! So fun to hear you enjoyed it! 🙂 Thanks for the sweet message. Would love to hear what else you try the dressing on!! This recipe is unbeatable. I made it for my meat-eating roommates and they all loved it 😛 This is definitely being added to my list of winners! Thank you! Yessss! Totally makes my day to hear carnivores devour (and love!) their veggies 😉 Score 1 for plants! So glad you found a "keeper" recipe 🙂 What an awesome message – thanks for coming back to let me know!! Katlin, I want to take this to a dinner tomorrow. Do you think I can assemble the salad today and then add the dressing before the dinner tomorrow, or do I need to do the entire work in the morning. Hi Jane! Yes! You can definitely make it today, and add the dressing right before serving tomorrow. It's a great make-ahead meal 🙂 Hope you enjoy!! Have a lovely weekend! I just made the dressing so it could chill for a few hours to let the flavors meld – it's delicious! I added about a tsp of agave and used half a large avocado, thinned with a bit of water. For those who thought the garlic is too strong, try roasted garlic next time. I love garlic, but raw gives me the WORST heartburn. I love making homemade salad dressings, and any time a recipe calls for garlic I use roasted instead. I typically keep separated cloves in the freezer. Kaitlin I'm sorry if you answered this question before but I didn't see it in the comments. Do you add 1/2 avocado and the yogurt or just add either one? Thank you!!! Hey Tina! No problem at all 🙂 Either option works (or both!) It's a pretty forgiving recipe you can play around with. Now I always use 1/2 of an avocado and thin it out if necessary. But you could use 1/4 of an avocado and 1/4 cup yogurt if you wanted too!! Hope you enjoy! I made half the dressing; left out the romaine, and spooned the mixture into endive blades. Fantastic! A new favorite recipe. Thank you! Awww, YAY!!! Glad you're as crazy about it as we are! 😉 Thanks for the super sweet message, hope you have a great week! This salad looks AMAZING but my Mom doesn't like cilantro. Can I use parsley or is there another dressing I could use? Hi Diana! I haven't personally tried it, but a couple people have left comments that basil works well (I bet parsley would too – would LOVE to hear if you try it!!) Or if your mom is feeling brave, I've also gotten comments that people who don't normally care for cilantro actually enjoy it in this dressing since it's not too overpowering! 😉 I hope you find a way for you both to enjoy it! Hi Olga!! So fun to hear you're excited about the recipes! Hope you and your husband loved this one! There are so many amazing (and delicious) plant-based sources of protein 🙂 Hope you have fun experimenting!! Lunch today. And dinner. And tomorrow's breakfast… basically: GET IN MY MOUTH. Hahaha, best comment ever. It works as all 3 and snacks in between! 😉 Have a great weekend! Hi! I was wondering if you could make the dressing the night before? I was thinking it would intensify the flavors, but didn't want it to go bad or anything. Sometimes avocados (even blended) can get that brown color. Thanks! My husband cannot get enough of cilantro dressing. And I'm trying to stay vegetarian. I'm in desperate need of finding flavorful meals that will satisfy us both. I'm excited to make this one for him. Looks wonderful. Hi Kaitlin! I recently made this, and added grilled chicken rubbed with paprika. It was amazing, and my family has dubbed it a new "10" (aka family favorite). Wow! Very honored to hear you all enjoyed it so much 🙂 Thanks for the sweet message, and have a great week! This salad had so many flavors and was GREAT on the pallet even for the little ones! I made this salad with a family bbq and the whole family loved ! The fresh vegetables brought a needed fresh crunch and tied the whole meal together, definitely will be making this treat again! Yay!! I love meals the whole family can enjoy 🙂 Thanks for your sweet comment, and have a great weekend! Hi! If you have apple cider vinegar or rice wine vinegar, that works great too. Otherwise you can just leave it out and tweak the other flavors as needed (more lime juice or lemon juice). It's really a fun recipe to play around with and is very forgiving! This dressing is seriously one of the most delicious things I have ever eaten. I have it almost memorized. I had to hunt down this page to leave a comment.. Sooo good. Your salads and dressings sound yummy! Could they be made without the oil? Trying to go WFPB so no oils. What would be a good sub? Hi MaryAnn! So great to hear from you – I LOVE that you're going WFPB & no oil!! We've since done that as well, and looking back at this recipe it seems like a ridiculous amount of oil! I'll make a note in the ingredients, but for no oil, I'd thin it with a little water instead, and maybe add a little more lime juice 🙂 It's a really fun (and mostly forgiving!) recipe to play around with. Hope you enjoy!! First of all, I discovered your blog about 3 weeks ago, when we had a Healthy Potluck at work. A co-worker had pinned your Ultimate Chopped Greek Salad and made it for the lunch and I couldn't stop eating it! I made it a few days later! Since I found your blog I've made about 5 recipes, every single one is delicious! I made this salad tonight, as it's 92 degrees outside right now and I just wanted something cold and fresh. Great salad, LOVED the salad dressing. I made mine with avocado. I'm not vegan but my daughters are and I love preparing your healthy vegan meals for them! I love how you avoid processed foods! Is it best served right after you toss with the dressing or can it be made ahead of time?